Finery London is an online womenswear brand with a unique point of view and a mission to make modern, inspiring and sophisticated styling accessible, without compromising on quality. The company was founded in 2014 in London by a creative team with real fashion chops. Its head of design, Emma Farrow, helped turn Topshop into a London Fashion Week player, and brand director Caren Downie was the former buying director at ASOS. Selling a curated selection of own-label designs, Finery managed to set itself apart from competitors. Less than a year since it made its first sale, the brand earned itself a crucial position in the wardrobes of a growing category of stylish London women. Finery’s focus on high quality design and clean lines is visible not only in their apparel collections but also their online presence. The company’s website can be described as Clean, Contemporary and Visual. There is, however, much more to Finery’s website than just aesthetics. 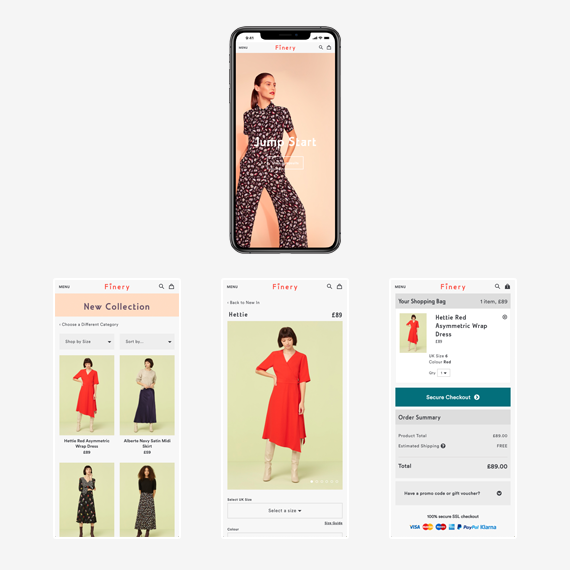 To mark the launch of its autumn/winter 2015 collection, Finery gamified its e-commerce experience with In The Mood For feature that enabled the customers to browse by mood. Users were invited to choose between a series of either-or images to determine which garment best suited their frame of mind. It is therefore no surprise that Finery’s Spree based website was named Website of the Year at the Retail Systems 2016 award show. The goal was to develop an online store that would meet the needs of the company’s customers, whilst maintaining the level of class the Finery brand represents. After delivering an initial, invite-only release within three months, which allowed to gather data from real users without opening the floodgates, Finery store was launched to the public in February 2015. The Finery team has since gone on to achieve massive success. The business attracted 100,000 customers (and over 3 million visitors) in the first 12 months after launch. It also beat all the expectations as far as online sales were concerned reaching an incredible £5 million in their first year. Finery London chose Spree for their modern and elegant e-commerce platform. When it comes to clothing, they expect nothing short of the perfect fit. Nothing less could have been expected of the website, which was the first and at the beginning the only meeting point with the company’s customers. The results in the first year after the site’s launch speak for themselves.